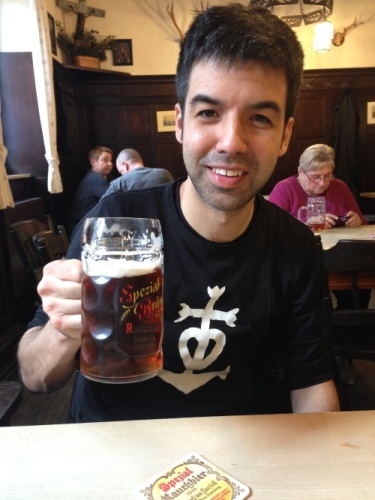 Blog・ブログ | Daniel Morales | Writer, translator, drinker of tea and beer. Some folks go to the beach during the summer. I translate Japanese fiction. The book I worked on this summer is available for pre-order and will be published by Vertical on January 29. 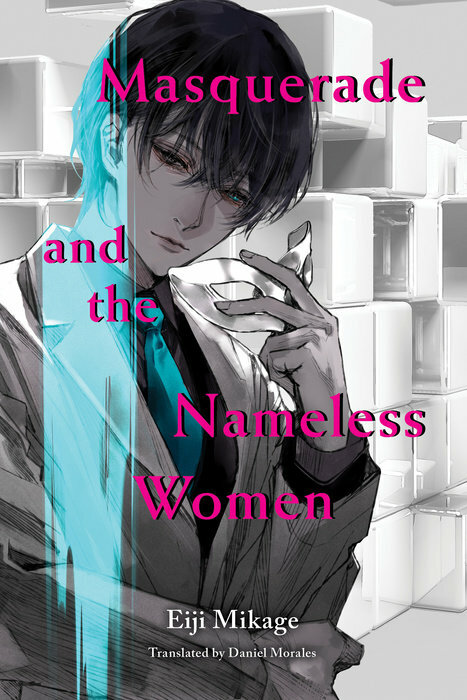 The book is titled “Masquerade and the Nameless Women” by author Eiji Mikage. 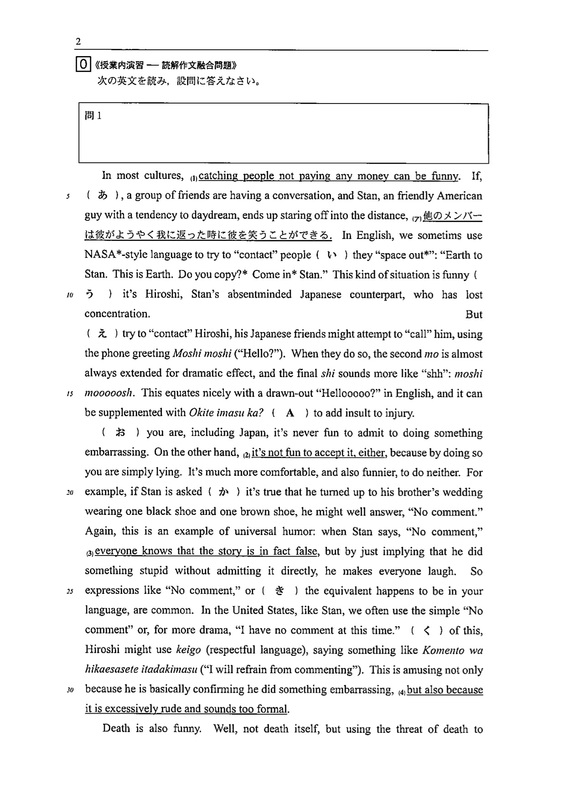 Follow along over at How to Japanese for more information. Pre-order on Amazon or at your preferred bookseller. This entry was posted in Japanese, Translation on December 16, 2018 by Daniel. It does feel like an impulse. Especially taking that first step. Shaping a finished piece of writing–editing it–feels to me like a more conscious, controllable act. I step back from the impulse to see what it is that I’ve produced. This entry was posted in Writing and tagged writing on December 23, 2016 by Daniel. 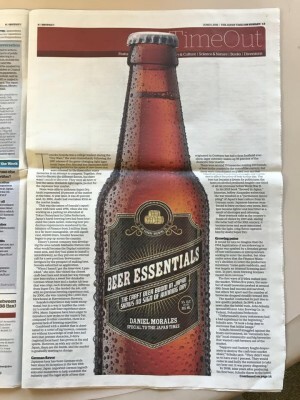 I was in The Japan Times a week or so ago with an article about craft beer in Japan: “Beer Essentials: The craft beer boom in Japan shows no signs of running dry.” I’m pretty happy with the way it came out, both the text and the awesome layout they put together. This is my first feature article anywhere and my first non-Bilingual, non-Murakami article in the JT. I wish I had better news to report: Japanese craft beer is gradually becoming more plentiful, but it’s still expensive and the quality isn’t improving as quickly. Although, to be perfectly honest, I think the quality of American craft beer isn’t all it’s made out to be. Yes, we have a lot to choose from, but it’s not cheap, and it can be difficult to find reliable breweries. The truly excellent breweries are thriving: Sierra Nevada, Goose Island, Ommegang, Boulevard, Brooklyn…in terms of smaller more regional breweries that I’m familiar with, Urban Chestnut, Revolution, Prairie, Cigar City. But for each of these you have smaller breweries that are producing subpar beer. Breweries that will devote half of their tap selection to IPAs that are difficult to distinguish. So I think the comparison with the U.S. scene is overblown. I was impressed with Japanese macrobrew on my last trip. Yebisu and Yebisu Black are delicious beers. Even Super Dry is very drinkable…it has a nice bitterness not present in most American macrobrew. If only it were a bit cheaper…maybe 50-80 yen cheaper per can? I guess we just have to hope for a tax equalization at some point. 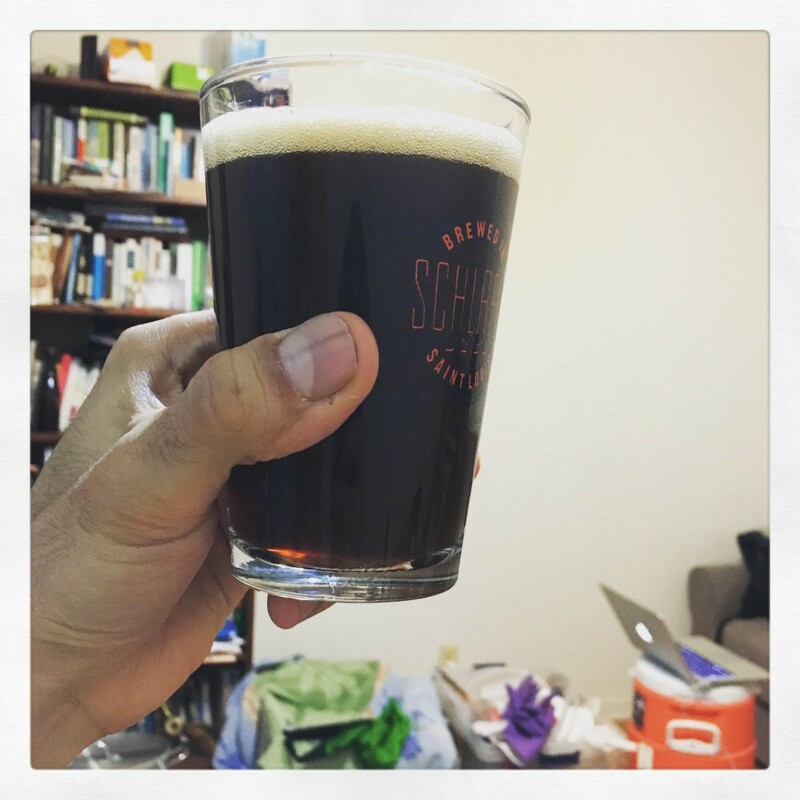 This entry was posted in Beer and tagged craft beer, Japan, jibiiru on June 18, 2016 by Daniel. When I graduated from college I got an assortment of gifts from friends and family. Few of them stand out because they were mostly checks and gift cards, but one of our family friends got me a large beach towel in addition to a $50 gift card about a year after I finished. At the time I had just gotten into Thelonious Monk. I visited a friend in New York for a quick vacation before shipping out to Japan on the JET Program, and my friend’s roommate had two huge folders of CDs. This was the tail end of the CD era. I didn’t have an iPod yet, but I did have a nice collection of music on my computer. I spent a few hours going through the folders and ripping things that looked interesting into iTunes. I know I took a T-Rex album, but I can’t remember anything else other than the Monk’s Straight, No Chaser, an album the roommate recommend as a first step into his music, and Alone in San Francisco. Once in Japan I hooked my laptop up to the large television supplied by the town and piped music through its speakers while I cooked dinner or cleaned around the house. This is how I fell in love with Monk. Chopping onions for an omelet, hanging wet clothes to dry outside (or inside if it was too cold), sweeping and wiping the tatami mats cleans. I also played Monk while driving around Fukushima Prefecture in my tiny Daihatsu Mira. I took a few trips into Tokyo for a conference and for the winter holidays, and each time I returned with more Monk. His solo albums, his work with Sonny Rollins, his early bebop and the wild Brilliant Corners. The RECOfan in Shibuya was my go-to shop. They always had good deals or a surprising find. When I went home to New Orleans to see my brothers graduate in May and was surprised by the belated graduation gift, Monk was the first thing I thought to buy with the gift card. I used it on Monk’s Dream and the documentary Straight, No Chaser. We went to dinner with the family at one point while I was home, and I told them what I had bought. “Thelonious Monk? !” the mother said with half-sincere, half-joking incredulity. “We wanted you to have some fun! That’s why we got you the towel.” She then laughed a little. 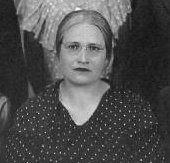 I am certain she had no real idea who Thelonious Monk was. Which is too bad. 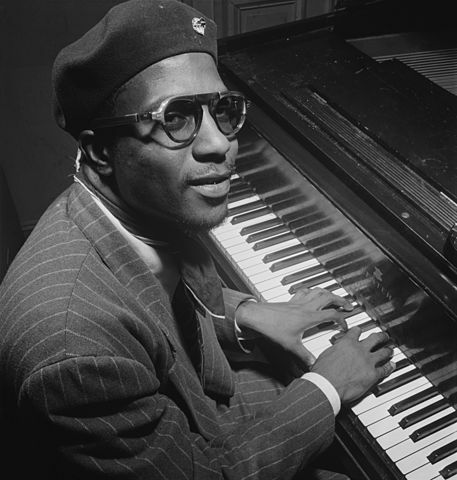 There aren’t many musicians with a greater spirit of fun than Monk. I’ve never been able to forget her comment. I actually think about it pretty often. When I’m listening to Monk. When I use the towel, which I’ve brought to music festivals and events but not yet an actual beach that I can remember. More recently I’ve been using it to prevent bottled homebrew from becoming light struck. And to dry out my equipment after brewing. I’m sure these aren’t the uses that she imagined, but they’re still fun. Happy 10th birthday, beach towel. This entry was posted in Beer, Music and tagged homebrewing, Thelonious Monk on February 11, 2016 by Daniel. My brother David got married three weeks ago, and I was able to catch up with family I hadn’t seen for…I can’t even remember how long. 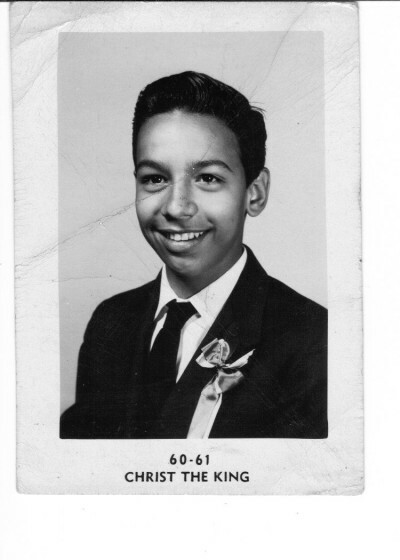 My Uncle Rey has been the keeper of the family history, combining his own research with that of a few other family members, and after the wedding he sent me a trove of digital material. My dad had sent me some written material a few years earlier so I had a loose idea of the history, but after Rey’s email I had pictures. I’ve put together the succession below. I may add more photos in the future. 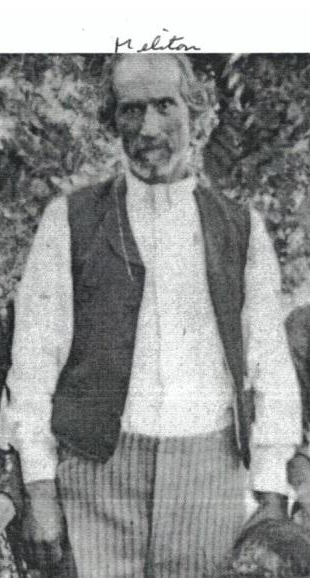 Meliton Morales (1836-1924) is my great-great grandfather. He’s not the oldest relative Rey has tracked down, but he is the most interesting. He was captured by Apaches when he was 7 and traded to the Delaware tribe for a blanket and a quart of whiskey (or so says the family history). He escaped at 16 or 17 and made it to Fort Leavenworth, Kansas, and then, strangely enough, to New Orleans (my hometown). 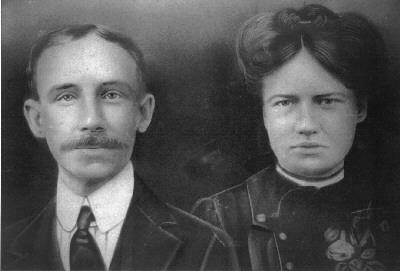 He later joined the Union Army in Texas, established a ranching empire, and earned a Texas historical marker. 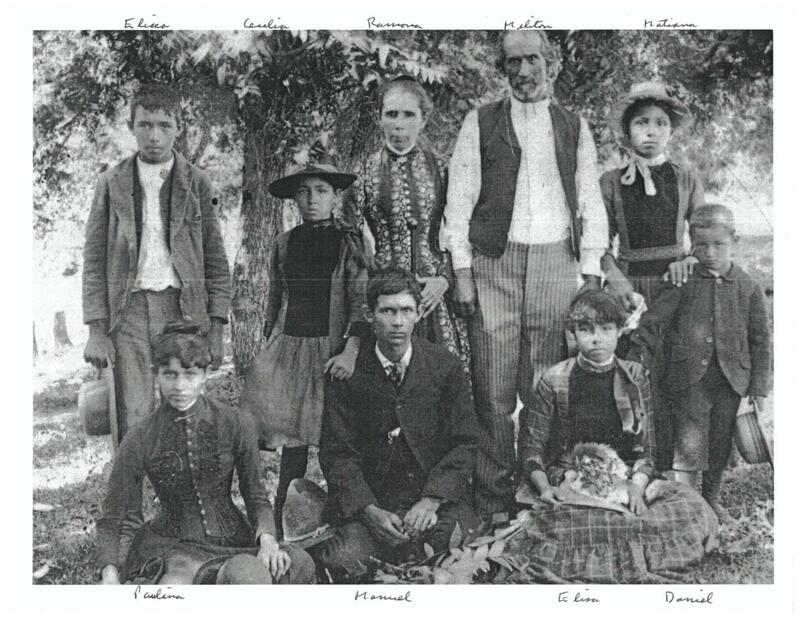 Eliseo Morales (1876-1922) is my great-grandfather. 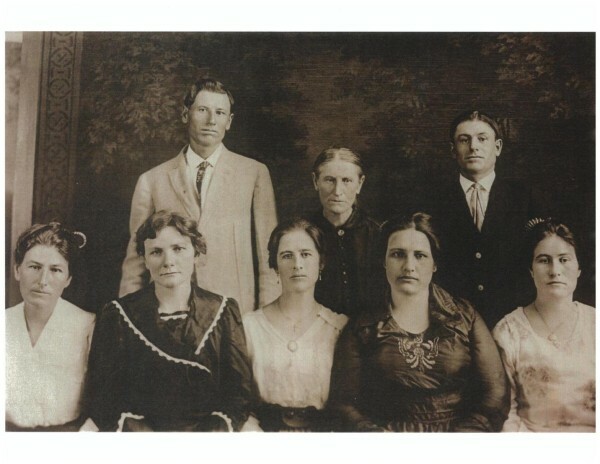 He was a twin with Elisa, lower right in the Meliton family picture above. 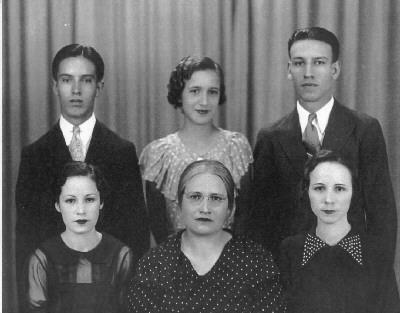 He married Angelita Camunez (1890-1946). 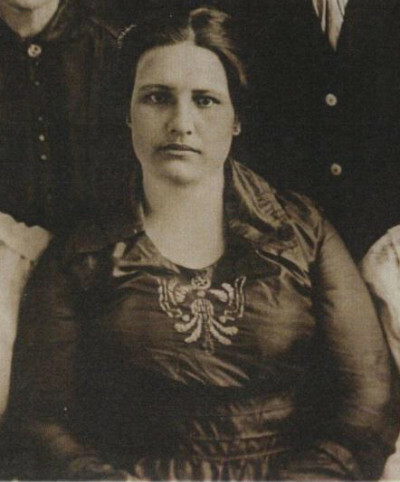 Angelita’s mother’s family was German, from the Markwordt family, one of nearly 20,000 German settlers who took land on the Texas-Mexico border. My grandfather Reynaldo Morales (1911-1992). 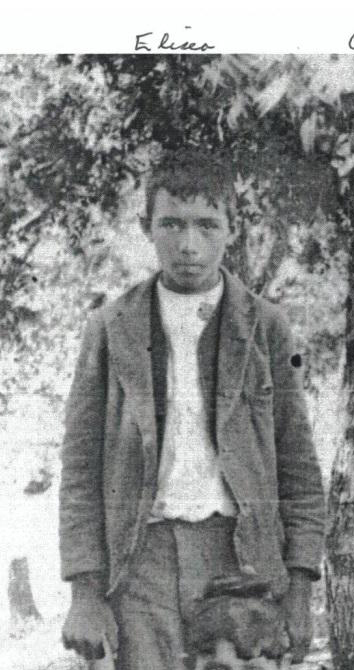 Eliseo died when my grandfather was only 11. 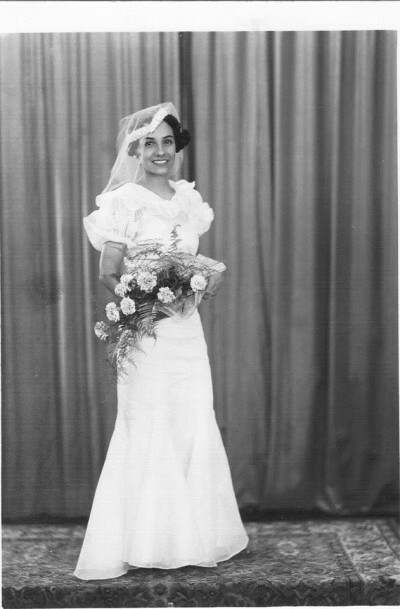 Reynaldo married my grandmother Eva Hurtado Morales (1910-1989). 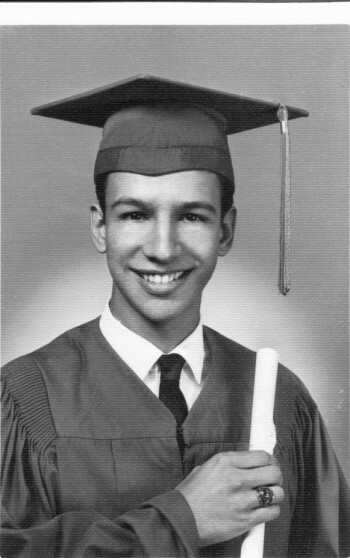 My dad Robert “Bob” Morales was born in San Antonio (I’ll leave out dates for now, heh). He met my mom, Marialice, in Dallas. 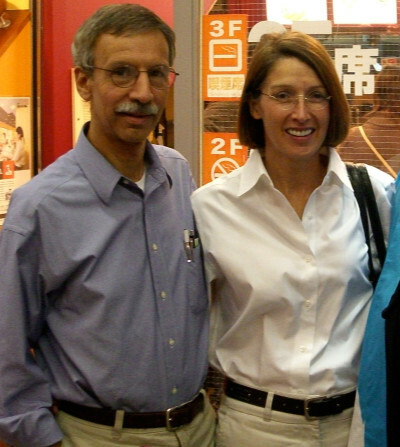 This is a picture of them in Japan in 2006. My brothers and I took pictures together at the wedding, but I don’t have any copies yet. 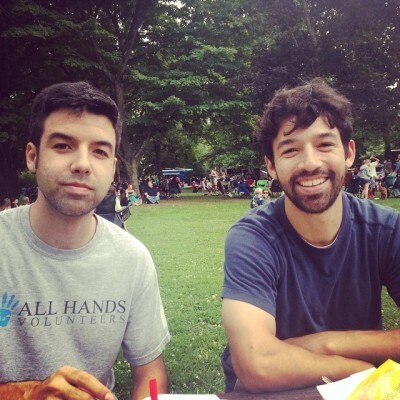 These are some of the more recent photos of us. Me on the left, David, and Tim below. 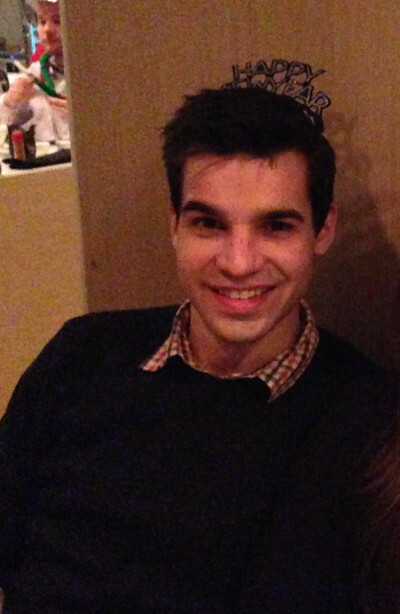 I’ll have to add a few younger pictures at some point. This entry was posted in Family and tagged Meliton Morales, Mier, Morales, San Angelo, San Antonio on June 27, 2015 by Daniel. I was supposed to visit Bavaria in 2010, right before I moved from Japan back to New Orleans, but then Eyjafjallajökull erupted in Iceland and I canceled my trip even though my flight was the first one cleared to fly from Tokyo to London: I’m an unabashed mama’s boy, and my mom may have had an aneurysm if I’d gone. 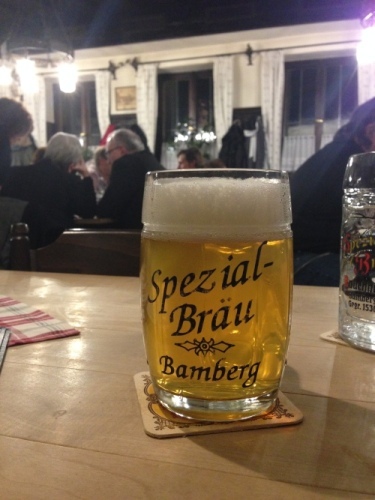 I spent the last five years thinking about that trip and imagining the beers in Europe, in particular in Bamberg, and finally this past month I was able to make up the trip. I planned a more surgical strike into Bavaria and Bohemia, covering Prague, Pilsen, Windischeschenbach (for the Zoigl communal beer), and Bamberg. The following are my favorite 15 beers of the trip. 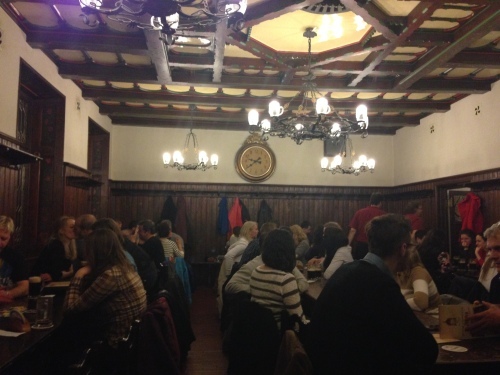 U Fleků was a beautiful traditional-style Czech pub not far south from where our hotel was on the edge of Old Town. 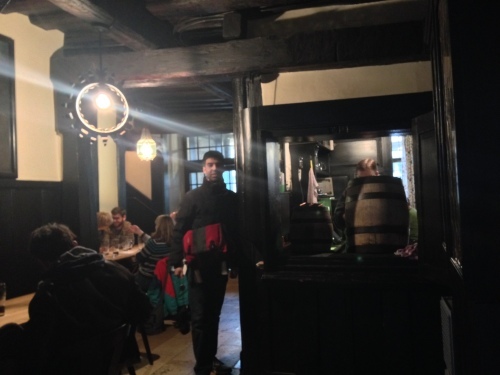 They only have one beer—a dark lager—and you don’t even have to order: Waiters walk in carrying huge trays full of beer at regular intervals. The dark lager here had the most flavor of any of the darks I tried the whole trip: Lots of Czech yeast character (the slightest touch of sulphur) and a hint of roast in a beer with slightly more weight than the lighter 10 plato beers that are standard in the country. Delicious. After two straight days of lager, it was refreshing to see a Czech take on an American style ale. The proprietor of U Kunštátů recommended the IPA from the small brewery Matsuka, but I needed something lighter, so I went with the APA. And I’m glad I did. It was basically a perfect beer. Crisply and cleanly fermented, very bitter, and fruity but not overhopped. I’d say it was probably better than 80-90% of American-made American pale ales. 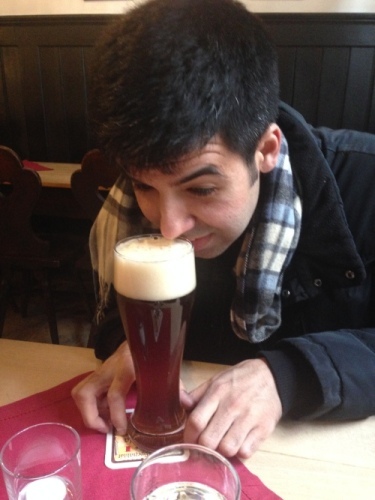 This was the first beer I had in Germany, so it will always have a special place in my heart/stomach/liver. Apparently it’s a local macro-ish brew produced now by the Nuremberg brewery Tucher. It’s a classic German pils: pale and crisp with a subdued hop bite. It went fantastic with Nuremberger sausages. I had one the night before we left so it was nearly my final beer in Europe, but I snuck in an Alt at the airport in Dusseldorf. Points off for this one coming from a bottle, but it was delicious and just as smoky as the cask marzen. We killed some time here our last morning in Bamberg waiting for a nearby store to open, and we watched older men take up spots at the table to down a couple early beers. I couldn’t tell much difference between this and the marzen, to be honest, but I know it’s higher in ABV. Beim Käck’n is up the hill in Neuhaus in Windischeschenbach. 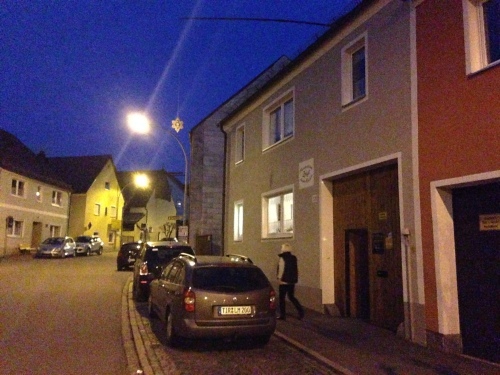 We got a little lost in the small neighborhood, but once we found the main street it was easy to spot the Zoigl star. The beer was good, just about the same as the location down the hill but slightly less carbonated. 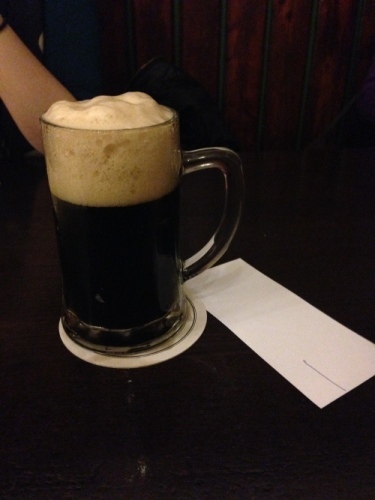 The beer is semi-dark (Munich malt?) and surprisingly hoppy (from what I was expecting), but not hoppy in the American sense. 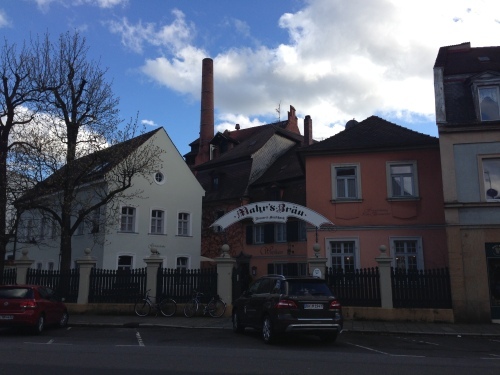 They use exclusively German noble hops which are a bit milder compared to the West Coast snuff. We made friends with some older German guys who were excited that we were there. Good times, solid beer. Beim Glosser was right around the corner from our hotel. They recommended sausages stuffed with cheese, and the guy who sat down next to us told us we had to eat them hot. The beer was slightly spritzier than the other Zoigl. Other than that, it was difficult to tell a difference. My notes say that it might have been hoppier, and I vaguely remember thinking that maybe they dryhopped it. The next day was my first true hangover of the trip, although I blame part of it on the loss of an hour due to daylight savings time change. 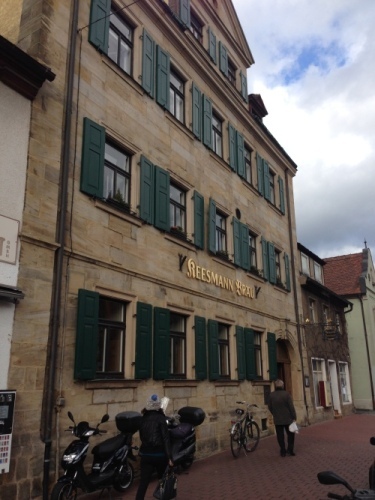 Keesmann is right across the way from Mahrs, but we failed to visit on our first trip to that neighborhood of Bamberg because we were full of schnitzel and already drunk, so we had to make a second trip—no complaints. Just a quick trip in for the beers here. 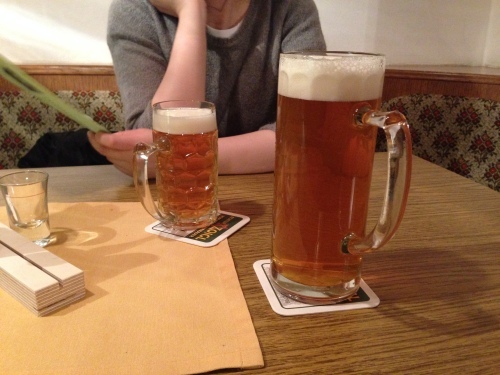 We had the Pilsner and a Bock. 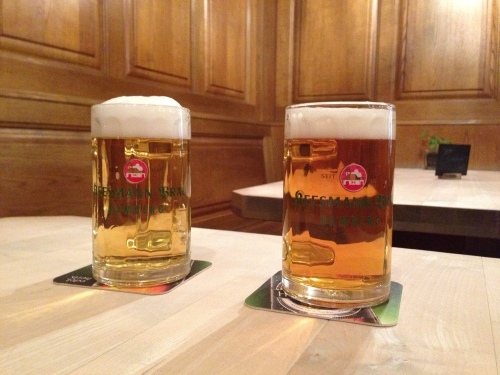 The Pilsner was on the left. You can see how pale it is. Incredible. Clear and crisp with a sharp hop aftertaste. It was the best Pilsner on the trip, and I’m glad my friend encouraged me to make the trip back for it. It took two trips to Mahrs to fully appreciate this beer. The first trip was made very late in the evening after a drunken nap that went longer than I intended. The beer was hoppy, a bit sour (not in an unpleasant way), and yeasty. The mug we had the second trip may have been fresher—it was more carbonated and seemed slightly paler. I imagine that the cask we got the night before had been sitting out for longer than the second one. A fantastic beer. One that you can just drink forever. When I think back now, it seems to have similarities with the Zoigl beers. For lunch one day in Prague we went up to T-Anker, this restaurant on the top floor of a small shopping center. They had a great view of the city and a very respectable selection of beers, including even one from Matuska. The Úněticé 10° světlé is your basic pale Czech lager. I love that the breweries put the gravity of the beer on labels in the Czech Republic. Just multiply by 4 to get 1.040, the gravity reading that homebrewers might be familiar with. This is a low gravity that results in a 4% ABV beer or so. 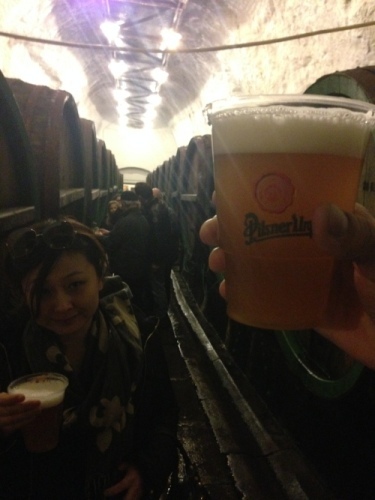 It has the characteristic Czech yeast flavor—a little bready with traces of sulphur. It was so good that I had another in lieu of coffee or dessert. I’ve been back for two weeks now, so all the flavor sensations feel just beyond my memories, but this one stands out for its pleasant bitterness, for being unfiltered (like many), and well carbonated…which was not true of many of the Czech beers! I feel like they were either purposefully not well carbonated or gassed off during the serving process. The beers were served with lots of foam, and often the server jets the beer aggressively into the bottom of the glass in order to generate the foam, which reduces the carbonation. 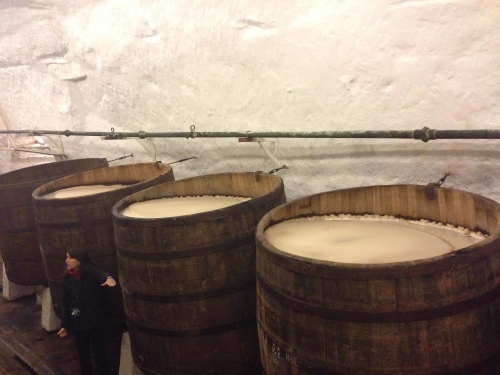 The last stop on the Urquell tour is the caves under the factory where they still have a few wooden barrels full of beer fermenting openly—you can see the krausen threatening to spill over the top. Then they take you a little farther into the lagering cave where the barrels have been sealed and rolled up next to the walls. A friendly old man pours everyone a cup full of unfiltered, unpasteurized Pilsner from one of the barrels. It’s pretty magical experience for a beer nerd. The beer itself is perfect. Slightly higher in alcohol and more golden than Czech pale lager thanks to more barley and a triple decoction. 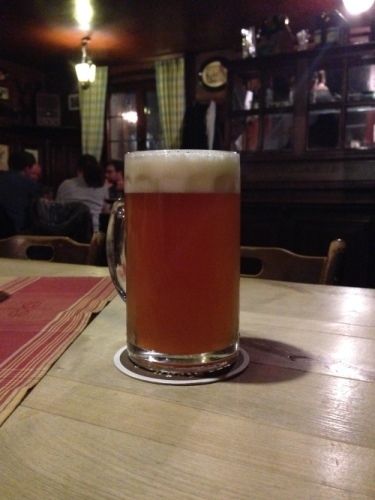 It has many of the same characteristics as the other Czech pale lagers but is much richer. This is the beer I booked the trip for. My friend Paul recommended it to me at some point when I was living in Tokyo, and I eventually picked up a bottle at a shop in Mejiro (the legendary Tanakaya). 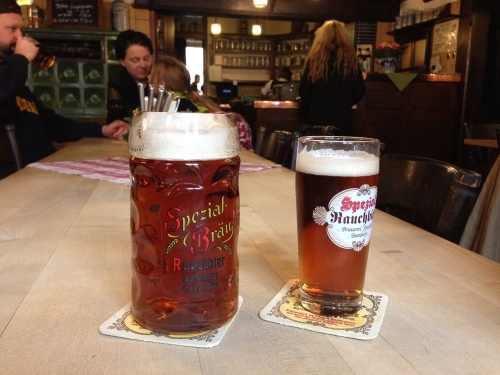 I was hooked on rauchbier. 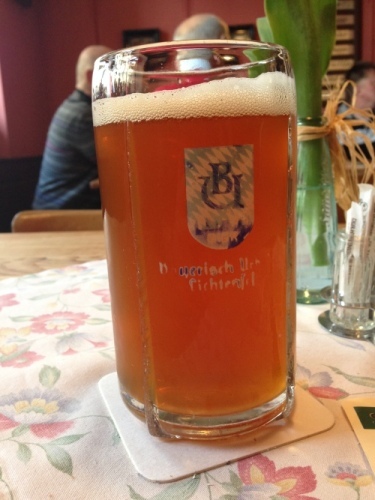 It’s surprisingly different on cask in Bamberg: the smokiness is far more intense, and different in quality from the other rauchbiers in Bamberg. There’s something more phenolic and smokey rather than bacon-y. It’s just on the border of being over the top and unpleasant, but it’s not. It’s very good. Much darker than the other rauchbier in town. 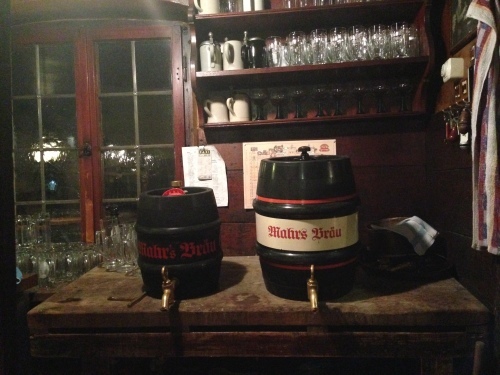 The marzen is on the left. 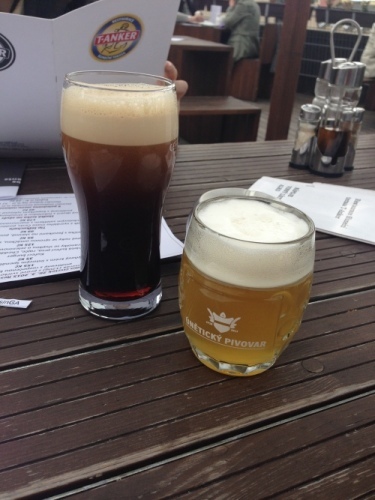 The beer on the right is the seasonal fastenbier. This is one of the beers I think back to most often. 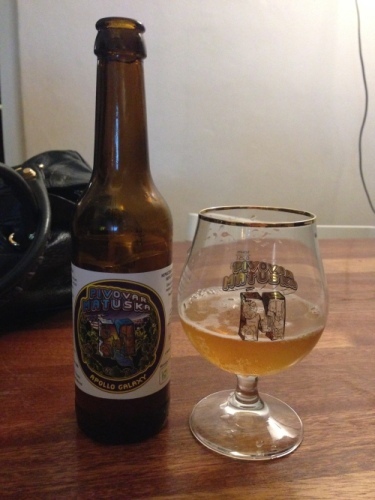 It’s also one of the few beers that generated an almost physical response in me: I was shocked how good it was. This isn’t to dismiss the other beers on the trip—they, too, were amazing—but I just wasn’t ready for how superlative this beer was. My buddy Paul, who was there, too, said something like, “How do they do that?” And I couldn’t say. Landbier is a pretty simple style. Mostly Pilsner or Vienna malt, probably some Munich malt, hopped with Hallertauer hops, fermented cleanly with a local lager yeast, and served in a ceramic mug. I wish I’d gone back for another. Next time I’ll have to make the trek to Buttenheim. I know U Kunštátů was a nice bar because when we arrived looking for food, they told us they had none and recommended a nearby brew pub (basically a competitor). 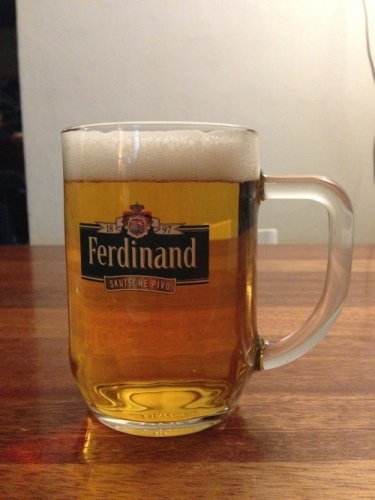 After being fed and sauntering around Prague for a bit, we came back and I asked for a mug of the only beer they had on tap—Ferdinand. I’m not sure whether it was their 10, 11, or 12, but I’d guess the 12, which would be the same gravity as Pilsner Urquell (i.e. 1.048 OG). 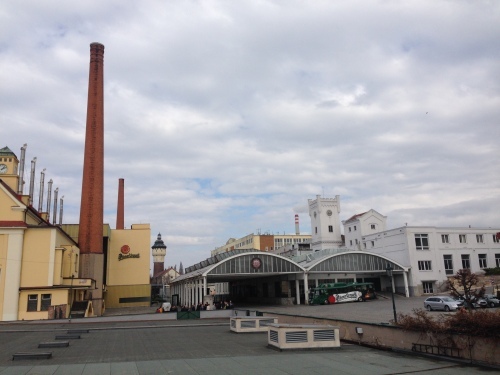 They said it had been kegged “two hours” before, which could be true since Benešov, the town where Ferdinand is brewed, is only a half hour away from Prague, but I took it to mean that the beer had been kegged that day and was extremely fresh. It was crisp, not completely clean in a very typically Czech way, and clear despite the fact that it was unpasteurized and unfiltered. My notes tell me there wasn’t as much sulphur as in the Pilsner I had with dinner, but that it still had some—that Czech funk. Just a delicious, crisp, bitter, spritzy beer. You can’t ask for much more. 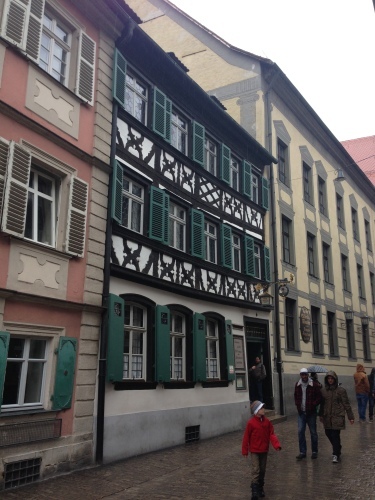 We stayed two nights at Spezial when we only intended to stay one, and I’m glad we did. Their breakfast spread was better, the rooms were better appointed, they had wifi, and the beer was amazing. But you don’t have to stay there to try the beer. 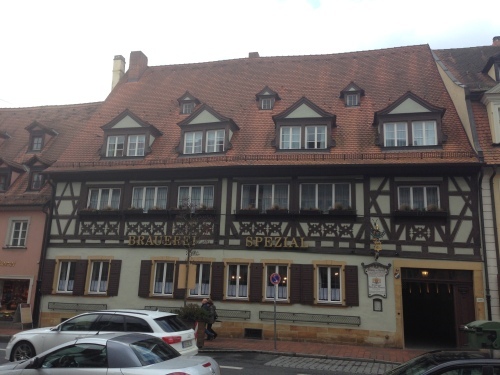 I didn’t have the U at Spezial until later on our first day in Bamberg. 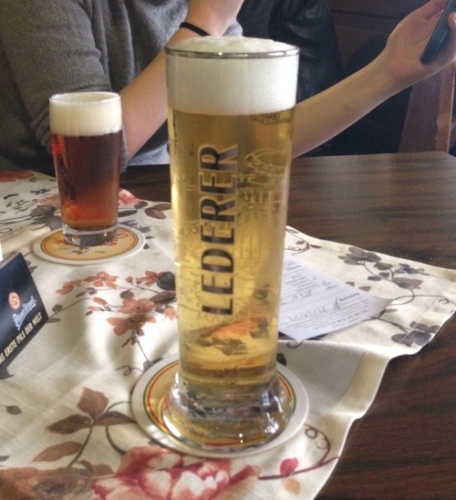 We had the lager, walked around the town, tried Schlenkerla, had a nap, and then came back down for a late night snack. The kitchen had already closed the hot food (Spezial is pretty strict with their meal hours), so I ordered Camembert and bread and one of these, which was a perfectly good snack for me. The beer was perfect. Noticeably bitter and hoppy with great malt backbone but still light. This is what beer is supposed to be. I had it a number of times on the trip, and the hoppiness seemed to vary slightly. For me, this was the beer of the trip. It’s a rauchbier, but they call it the “Lager” and that’s what you order. It’s crystal clear, nice and brown, and intensely smokey but not off-putting at all. On the contrary, because your taste buds get used to the smoke, you just keep drinking more and more in search of that first smoke shock. 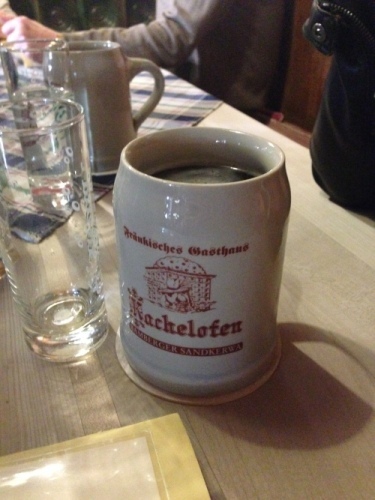 The smoke was more hammy than the Schlenkerla rauchbier and paired perfectly with German food. It’s also served off gas instead of off cask, so it has some carbonation to it, which was good for me. I like bubbles in my beers. Definitely worth the trip. I thought I had done a good bit of drinking on the trip, but now that I sit down and tally up all the beers, I seem to have averaged three beers a day, which is a pretty reasonable pace. It’s a marathon, not a sprint. 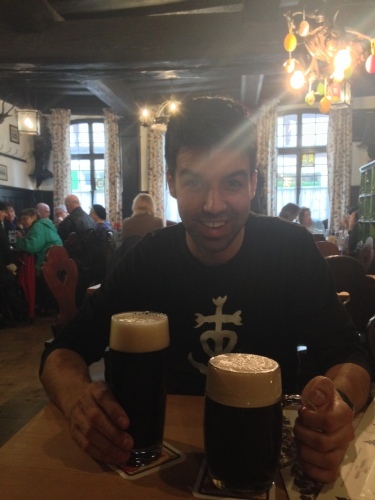 I have to thank Paul for recommendations (especially the Zoigl tip) as well as the Prague tourism website (which never failed us—they only list solid bars and restaurants; check out the PDF at the bottom of the link) and Fred Waltman’s The Beer Drinker’s Guide to Bamberg. So go on and get over there. The dollar is mighty at the moment, and the transportation in Germany and the Czech Republic made getting around an absolute pleasure. 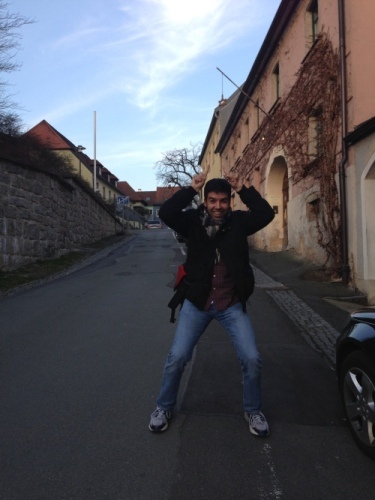 This entry was posted in Beer, Travel and tagged bamberg, beer, czech republic, germany, prague, windischeschenbach on April 25, 2015 by Daniel. 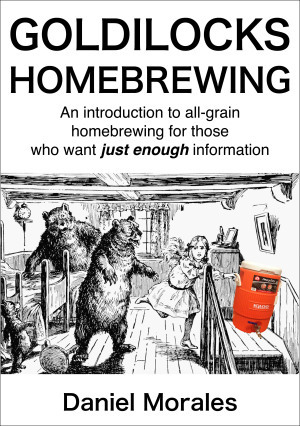 My first book “Goldilocks Homebrewing: An Introduction to All-grain Homebrewing for Those Who Want Just Enough Information” is now available for pre-order on the Amazon Kindle Store. Other than reading Murakami, homebrewing is one of the things I’ve been doing the longest. The book, however, is only a recent development which I started after transitioning to all-grain brewing last year. 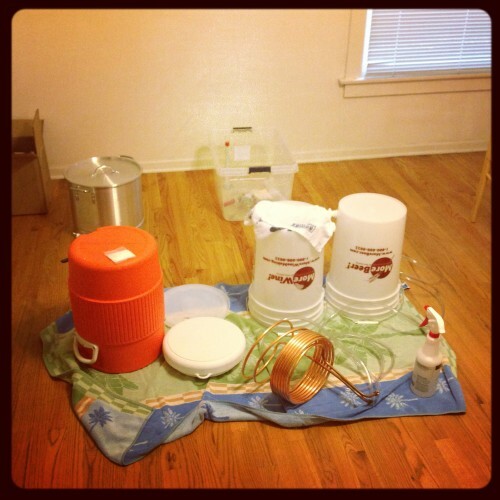 It was frustrating to wade through all the homebrewing noise on the Internet, especially when it came to building a mash tun, but once I’d done it and brewed a few batches, made a few recipes, it didn’t feel so hard. My goal with the book is to make those first few steps easier and more affordable for others. linebreaks to render paragraph spacing in epub. This is ugly code. After talking it out on the Literature and Latte forum, however, I decided to live with the compiled code, and I’m glad I did. I saved myself a lot of time, and judging from tests on the Kindle Previewer and on the Amazon website, it will look just fine. 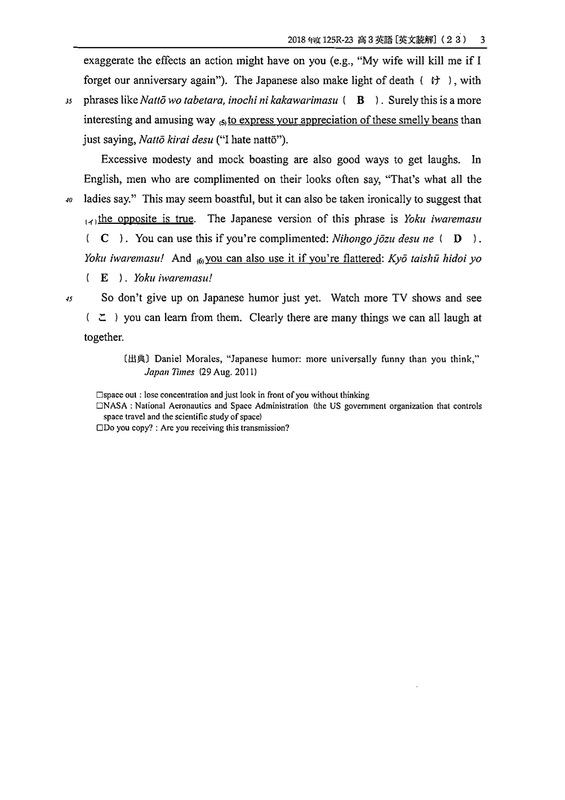 I have to admit that my formatting is extremely simple. If you have fancier things you want to do with your styling, then it might be best to find a way to output the simplest epub code possible and style the CSS yourself. It’s better to use Sigil to insert images into epub files than Scrivener. 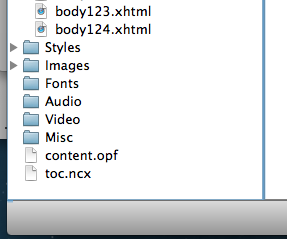 After testing out images in Scrivener, I didn’t even bother trying to get Scrivener to format my images correctly. I just left markers where I wanted photos and used Sigil, an easy-to-use open-source epub editor, to input and style the photos. Just right click on the Images folder and select “Add Existing Files.” This will load the images into the epub file. Find your photo locations within the book and then use the “Insert” menu to choose the file. The program shows a list of the images that are in the epub and a preview of the image, which is really helpful. Once the image is in the epub, you can style it within the html view using the width tag. I resized all my images using Preview rather than Photoshop because it seemed to produce better looking (and smaller) images. I’m sure this has something to do with my total lack of Photoshop chops, but it was easy, quick, and produced results I could live with. The Kindle Direct Publishing user interface is really easy to use. Once I had the manuscript ready, there were only two screens worth of information to fill out: the first asks for basic information and the second asks for rights and pricing information. The details you need are: title, subtitle, description, ISBN, categories (which you choose from a list), age range, search keywords, and release date (if you plan to sell pre-orders). 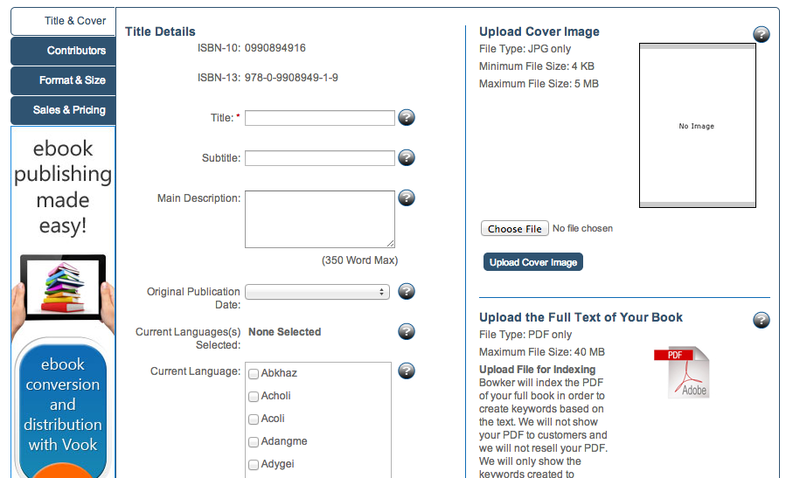 You also upload the cover and book file here. Once your book file is uploaded into the system, you can preview it in a browser on the Amazon page, complete with images and everything. Pretty cool. Once you’ve input all this information, you can also save your progress and complete it later, but you can’t proceed to the second page without uploading a file for your book. On the rights and pricing page, you choose the royalty rate and price in USD which determines the prices in the other Amazon markets (if you choose to make your book available there). This page also has “KDP Pricing Support (beta),” which runs some kind of calculation, I assume after searching through your manuscript for things like total word count and other keywords, and then generates a price-sales arc. Strangely enough, the optimum price it determined for “Goldilocks” was $4.99, which was the same price I had been thinking about. Buying ISBNs is really easy but expensive; assign the ISBN before publishing on KDP. I went with a set of 10, which makes each individual number cheaper. Bowker is the company that sells them, and they also have a relatively easy to use system that you can use to upload information about your book. Once you have the numbers purchased, they are registered in your account and you have to manually assign the book to them. This process is a little more in-depth than the Amazon KDP forms, but it’s not so bad, and there are very clear help prompts from Bowker that point out what the most common response is. For example, under “Target Audience,” the most usual answer is “Trade,” which is a general audience. I wasn’t sure whether to publish the Amazon file first or to assign the ISBN number first, so I called Bowker, and they said that it was correct to assign the ISBN first. Apparently Amazon will return an error if you try to submit a book with an ISBN that cannot be verified as being assigned to the book. Bowker also asks for a cover image, a description, and a full PDF of the book text. Apparently the text gets indexed for keywords and registered in Books in Print. It was easy enough to produce a PDF version by compiling in Scrivener. I think that’s about it. It was a fun process. There are a lot of different steps along the way, but as long as you take them one at a time, they aren’t so bad. Finish the book first. Then work on formatting: Get a good compile, insert images, style the html and CSS as necessary. 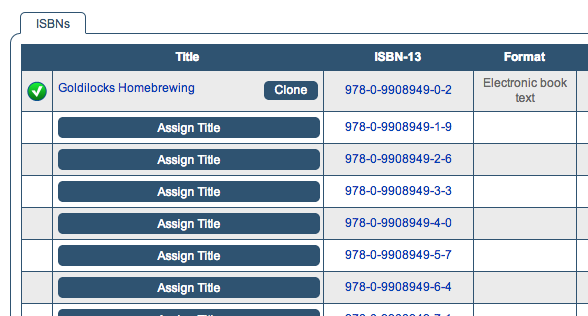 Finally, buy the ISBNs, assign the number, and upload your book to Amazon. I’d recommend starting to fill out the Amazon form while you fill out the Bowker form so that you can ensure that everything is uniform across the two. Check out the Golidlocks Homebrewing website to follow progress there. This entry was posted in Writing and tagged amazon, bowker, epub, ISBN, kindle direct publishing, scrivener, sigil on October 4, 2014 by Daniel. 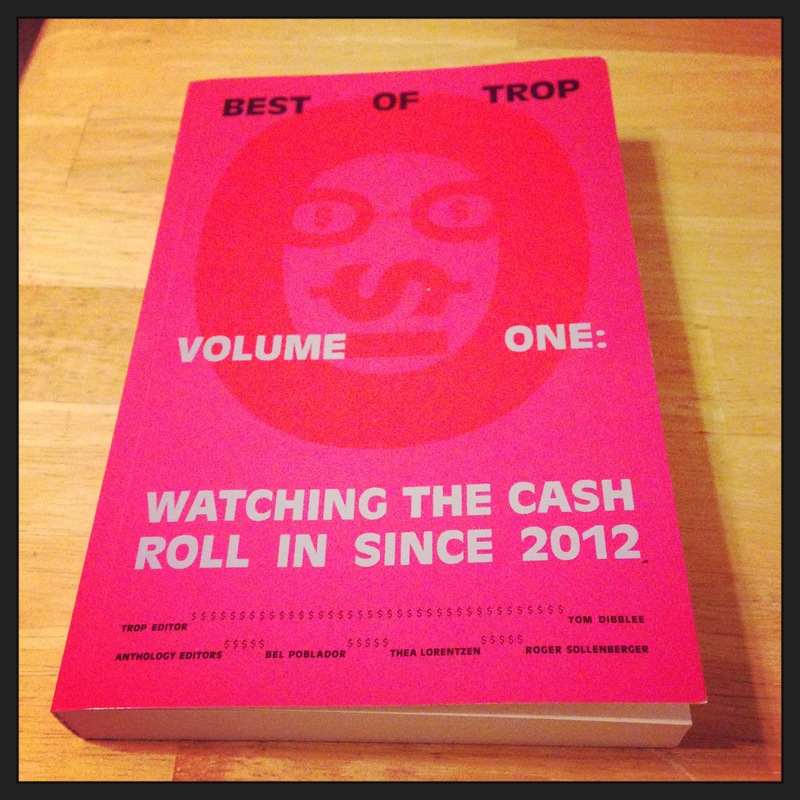 My essay “Distant Disasters” has been included in Best of Trop, Volume One: Watching the Cash Roll in Since 2012. Purchase your copy now! If you don’t have the cash to spare, there’s a digital version online that shouldn’t be too difficult to find. This entry was posted in Uncategorized on March 20, 2014 by Daniel. …the United States maintains 5,113 nuclear warheads, down from a peak of 31,255 in 1967. …we disseminated the information quickly, via all appropriate emergency channels. …you should probably shave today. …he didn’t tell his mother about backing into her Acura. …I went ahead and had another beer. …they kicked the can down the road. …I removed the kitten from the microwave. This entry was posted in Random on March 18, 2014 by Daniel.